Product prices and availability are accurate as of 2019-04-19 04:07:33 UTC and are subject to change. Any price and availability information displayed on http://www.amazon.com/ at the time of purchase will apply to the purchase of this product. 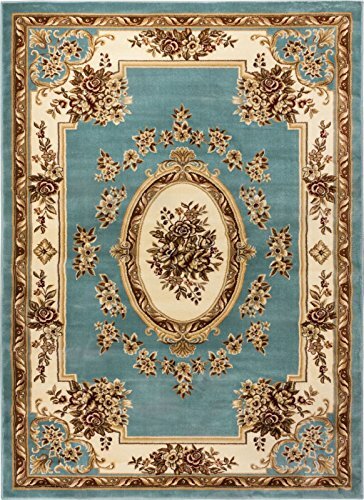 Pastoral Medallion Brown is a traditional rug for the modern home. With a classic yet trendy French European floral medallion design and a multi color palette of warm, jewel tone colors, dominated by rich Brown. A plush 0.5" pile of heat polypropylene lends an exceptionally soft hand. This yarn is stain resistant, and doesn't shed or fade over time. The 100% jute backing is safe for wood floors and all four sides of the rug are serged for improved durability. Perfectly suited for the luxurious yet active lifestyle and built to last for years. Thick, plush 0.5" pile height. 100% polypropylene power loomed in Turkey. Stain resistant and fade resistant. 100% jute backing is safe for wood floors. Extremely durable and very easy to clean, made to last for years. Traditional rugs for the modern home. A formal, European, French medallion with floral border pattern. Luxury, handmade feel at machine made prices.